Well, good afternoon, everyone. It is a great pleasure and an honor for me to welcome the President-elect to the State Department on behalf of the United States Government, and to formally congratulate President-elect Martelly on his victory in the election. I also congratulate the people of Haiti on the election. It not only affirmed and strengthened the foundations of Haiti's democracy; it also helped shine light on the work that has been done and the work that still has to be done to recover from the damage of the earthquake and firmly set Haiti on a path to long-term stability and development. And perhaps most importantly, this election offered the people of Haiti an opportunity to give voice to their dreams for their country's future. And now it will be up to Mr. Martelly and his government to do everything in their power to help achieve those dreams. This election comes at a critical moment. In the 15 months since the earthquake, there has been progress in important areas. Twenty percent of the rubble, more than 2 million cubic meters, has been cleared, and that was through a program that employed more than 350,000 people that the United States was proud to support. A new industrial park near Cap Haitien, through a joint effort by the Government of Haiti, the United States, and the Inter-American Development Bank has been created. It has its first tenant, the global textile firm Sae-A, which alone is projected to create 20,000 permanent export-oriented jobs. And we expect more companies to be drawn to Haiti because of a very important piece of legislation passed by Congress last year called the Haiti Economic Lift Program, the HELP program, which significantly increased U.S. trade preferences for exports of apparel from Haiti. We also want to acknowledge the successful response by the Haitian Ministry of Health and Population and the international community to curtail the cholera epidemic. Now these are successes that deserve to be celebrated, but we also know that there is a lot that lies ahead for the new president, for the government, and the people of Haiti. Still, there's a lot of rubble to be cleared. There are still 650,000 people living in camps. The hurricane season is once again approaching. We want to do everything we can to be a good partner for Haiti as it takes steps that it must take, making it easier, for example, to transfer ownership of state-owned land for affordable housing, to streamline the process for registering new businesses, getting construction permits approved, attracting investment and encouraging growth. We also know that the prisons in Haiti are overcrowded. Eighty percent of those detained have yet to face trial. Updating criminal codes, processing the backlog of demands, and implementing other judicial reforms will go a long way toward creating a functioning and more humane justice system. We know this takes leadership, which we have seen Mr. Martelly exhibit in his very vigorous campaign. We know it takes political will, which we know he has, a commitment to transparency and good governance, and to getting results for people. I am very encouraged by the campaign that Mr. Martelly ran, his emphasis on the people and their needs, his willingness to be very clear in what he hoped to achieve on their behalf, and now he has a chance to lead. And we are behind him. We have a great deal of enthusiasm. This is not only a goal of our foreign policy, but it is a personal priority for me, my husband, and many of us here in Washington. Thank you very much. 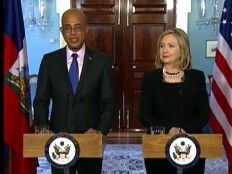 I would like to thank especially Secretary of State Hillary Clinton for having hosted me and my team. This is the second time that we meet since your visit in Haiti. I would like to extend my thanks to the Obama Administration and to the President himself. Once again, the elections of November and March demonstrated the fierce determination of the Haitian people to build its own democracy. Now, it is up to me to transform my campaign promises into an action plan. Clearly, I have huge challenges in front of me, but I intend to meet them. In spite of the generous donations of the American citizens, which have reached $1.2 billion received by 53 NGOs, and in spite of the donation by the Government of the United States of $1.5 billion, we still have 1.7 million people who still live under tents after 15 long months of waiting. The cholera epidemic, if it is not contained and if Haitians are not vaccinated, this epidemic threatens to extend itself to the entire country during the upcoming rainy and hurricane season. In addition, starting on June 1st, the country will have to confront up to 16 hurricanes scheduled – anticipated next summer. The reconstruction process is despairingly slow. These were the complaints that were expressed by a desperate population throughout my election campaign. This is why recovering and restarting the economy is a fundamental necessity for my government. This is why I plan on working relentlessly towards the reconstruction of the framework of international aid, to give new life to the business sector, and to develop the capabilities of government institutions and of civil society. Madam Secretary of State, I am truly counting on you to ensure that this restructuring of foreign aid be truly effective for Haiti. Bilateral cooperation also involves fighting against drugs and corruption, respect for human rights, the establishment of the rule of law, the increased and necessary role of our Diaspora community, TPS [Temporary protected status], deportees, good governance, recovering agriculture at a special moment where worldwide prices are drastically increasing, and the establishment of a climate favorable for potential and future investors. Our discussions focused on the urgent need to ensure that the aid will be effective for our citizens and to avoid waste. Finally, I discussed with the Secretary of State President Barack Obama's offer to create a partnership with Haiti. My new vision for my country is to engage in all of the useful and necessary reforms to ensure that Haiti will be a full member of the modernity of the 21st century.